سیناق گؤستریشی اؤلچوسو: ۸۰۰ × ۵۳۴ پیکسل. آیری کیفیتلر: ۳۲۰ × ۲۱۴ پیکسل | ۶۴۰ × ۴۲۷ پیکسل | ۱٬۰۲۴ × ۶۸۴ پیکسل | ۱٬۲۸۰ × ۸۵۴ پیکسل | ۲٬۰۴۸ × ۱٬۳۶۷ پیکسل. 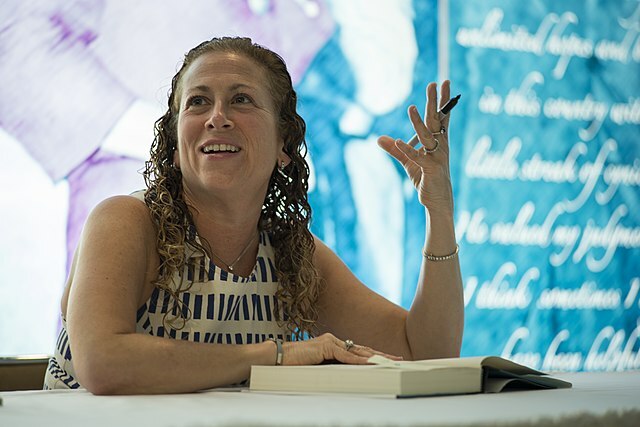 English: Best-selling author Jodi Picoult served as the 2013 Harry Middleton Lecturer on Tuesday, March 19, at 6:00 p.m. in the LBJ Auditorium. Ms. Picoult discussed her novel The Storyteller (Atria Books, 2/26/13). این نگاره در ابتدا توسط archivesnews در https://flickr.com/photos/55218980@N03/8579744353 به فلیکر ارسال شده‌است و در ۵ مارس ۲۰۱۷ توسط ربات FlickreviewR بازبینی‌شده و اینکه نگاره تحت مجوز United States Government Work منتشر شده‌است تأیید شد. Best-selling author Jodi Picoult discusses her new novel, "The Storyteller", as the 2013 Harry Middleton Lecturer on March 19, 2013 at the LBJ Presidential Library. She is the author of 19 novels, the last seven of which have debuted at number one on the New York Times bestseller list. Photo by Lauren Gerson.